A black and white negative of guests at Stonehaven's aviation garden party hosted by G. Norman and Kathleen Irwin. Stonehaven can be seen at the back of the photograph. 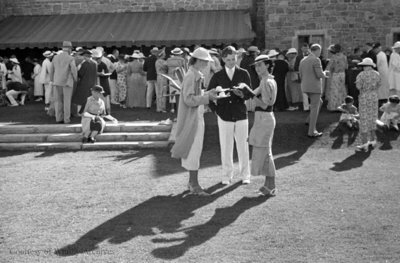 Stonehaven's Aviation Garden Party, June 1936, Marjorie Ruddy. Whitby Archives A2013_040_195B.